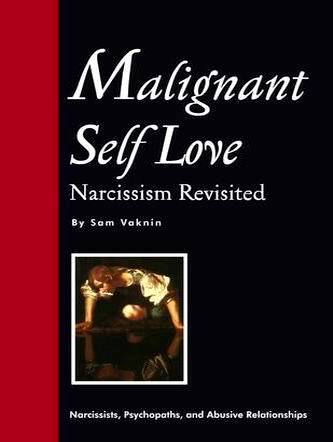 At first the narcissist presents himself as an ideal soul-mate. It is difficult to let go of this image. Denial wears many forms: from ideas of reference to persecutory delusions. Grief stages also include rage, depression, and acceptance. At the commencement of the relationship, the Narcissist is a dream-come-true. He is often intelligent, witty, charming, good looking, an achiever, empathetic, in need of love, loving, caring, attentive and much more. He is the perfect bundled answer to the nagging questions of life: finding meaning, companionship, compatibility and happiness. He is, in other words, ideal. At first, the narcissist is too good to be true. Then, he is too true to be good. It is difficult to let go of this idealized figure. Relationships with narcissists inevitably and invariably end with the dawn of a double realisation. The first is that one has been (ab)used by the narcissist and the second is that one was regarded by the narcissist as a disposable, dispensable and interchangeable instrument (object). We all react to loss. Loss makes us feel helpless and objectified. When our loved ones die – we feel that Nature or God or Life treated us as playthings. When we divorce (especially if we did not initiate the break-up), we often feel that we have been exploited and abused in the relationship, that we are being "dumped", that our needs and emotions are ignored. In short, we again feel objectified. Losing the narcissist is no different to any other major loss in life. It provokes a cycle of bereavement and grief (as well as some kind of mild post traumatic stress syndrome in cases of severe abuse). This cycle has four phases: denial, rage, sadness and acceptance. Denial can assume many forms. Some go on pretending that the narcissist is still a part of their life, even going to the extreme of "interacting" with the narcissist by pretending to "communicate" with him or to "meet" him (through others, for instance). Others develop persecutory delusions, thus incorporating the imaginary narcissist into their lives as an ominous and dark presence. This ensures "his" continued "interest" in them – however malevolent and threatening that "interest" is perceived to be. These are radical denial mechanisms, which border on the psychotic and often dissolve into brief psychotic micro-episodes. More benign and transient forms of denial include the development of ideas of reference. The narcissist's every move or utterance is interpreted to be directed at the suffering person, his ex, and to carry a hidden message which can be "decoded" only by the recipient. Others deny the very narcissistic nature of the narcissist. They attribute his abusive conduct to ignorance, mischief, lack of self-control (due to childhood abuse or trauma), or benign intentions. This denial mechanism leads them to believe that the narcissist is really not a narcissist but someone who is not aware of his "true" being, or someone who merely and innocently enjoys mind games and toying with people's lives, or an unwitting part of a dark conspiracy to defraud and abuse gullible victims. Often the narcissist is depicted as obsessed or possessed – imprisoned by his "invented" condition and, really, deep inside, a nice and gentle and lovable person. At the healthier end of the spectrum of denial reactions we find the classical denial of loss – the disbelief, the hope that the narcissist may return, the suspension and repression of all information to the contrary. Denial in mentally healthy people quickly evolves into rage. There are a few types of rage. Rage can be focussed and directed at the narcissist, at other facilitators of the loss, such as the narcissist's lover, or at specific circumstances. It can be directed at oneself – which often leads to depression, suicidal ideation, self-mutilation and, in some cases, suicide. Or, it can be diffuse, all-pervasive, all-encompassing and engulfing. Such loss-related rage can be intense and in bursts or osmotic and permeate the whole emotional landscape. Rage gives place to sadness. It is the sadness of the trapped animal, an existential angst mixed with acute depression. It involves dysphoria (inability to rejoice, to be optimistic, or expectant) and anhedonia (inability to experience pleasure or to find meaning in life). It is a paralysing sensation, which slows one down and enshrouds everything in the grey veil of randomness. It all looks meaningless and empty. This, in turn, gives place to gradual acceptance, renewed energy, and bouts of activity. The narcissist is gone both physically and mentally. The void left in his wake still hurts and pangs of regret and hope still exist. But, on the whole, the narcissist is transformed into a narrative, a symbol, another life experience, or a (tedious) cliché. He is no longer omni-present and his former victim entertains no delusions as to the one-sided and abusive nature of the relationship or as to the possibility and desirability of its renewal.